[S182] Social Security Death Index (on-line), Ancestry.com, SSDI, Ancestry.com, SSAN 398-12-4831. Frank Bechtle was born circa 1866 at KS. He was the son of John Bechtle and Mary Eliza Messenger. There was a Frank N. Bechtle enumerated in the 1900 Richmond, Franklin Co., KS, federal census, born December 1866, with Wife Mattie A. Among others they had a son John. Do not know if this is the same John. Ed Wilde married Alice H. Holcombe, daughter of Ira Luverne Holcombe and Hulda Marty. Ed Wilde died on 28 April 2007. [S182] Social Security Death Index (on-line), Ancestry.com, SSDI, Ancestry.com, SSAN 387-18-4666. Grace Bechtle was born in 1870 at KS. She was the daughter of John Bechtle and Mary Eliza Messenger. Permilia (?) married Montgomery Messenger, son of Truman Messenger and Lois Higley. [S135] Judge Oliver Seymour Phelps Phelps Family, page 129, item 124. Eva Ann Bechtle was also known as Phoebe Bechtle. She was born circa 1860 at IL. She was the daughter of John Bechtle and Mary Eliza Messenger. Charles and Susie were enumerated in the 1900 Minneapolis, Hennepin Co., MN, federal census. He was a type setter, age 30, she was 30. Children in the household were Ethelwyn 7, William 6, Louise 5, and Charles P. 2. Charles and Susan were enumerated in the 1920 Minneapolis, Hennepin Co., MN, federal census. He owned a printing busines and was 50, she was 50. Children in the household were Ethellyn 27, Charles 22, Fred 16, and Dorothy 13. [S182] Social Security Death Index (on-line), Ancestry.com, SSDI, Ancestry.com, SSAN 390-68-8073. [S135] Judge Oliver Seymour Phelps Phelps Family, vol. 1, page 371, item 1332. [S135] Judge Oliver Seymour Phelps Phelps Family, vol. 1, page 372, item 3291. [S335] Charles William Manwaring, Manwaring, vol 1, page 436. Clyde and Thyra were enumrated in the 1910 Hankinson, Richland Co., ND, federal census. He was 38, she was 28. The only child in the household was Louise K. 4. Harold W. and Mary L. were enumerated in the 1910 Precinct 6, Manatee Co., FL, federal census. He was a fruit farmer, age 37, she was 29. children in the household were Clyde P. 10, and Alice K. 2. [S182] Social Security Death Index (on-line), Ancestry.com, SSDI, Ancestry.com, SSAN 265-60-7577. [S135] Judge Oliver Seymour Phelps Phelps Family, vol. 2, page 1276, item 11. [S135] Judge Oliver Seymour Phelps Phelps Family, vol. 2, page 1276, item 57. [S135] Judge Oliver Seymour Phelps Phelps Family, page 511, item 5050. [S135] Judge Oliver Seymour Phelps Phelps Family, vol. 2, page 1327, item 228. Amanda Messenger was born circa 1832 at OH.1 She was the daughter of Montgomery Messenger and Permilia (? 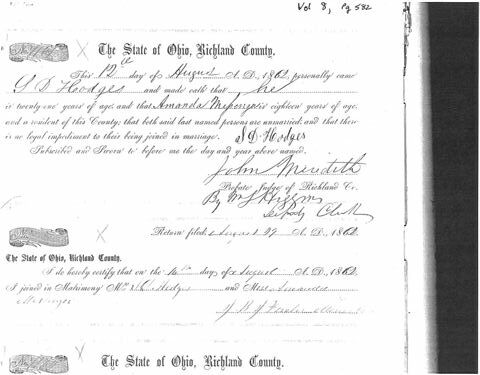 )1 Amanda Messenger married S. D. Hodges on 12 August 1862 at Richland Co., OH. [S629] Coralee Griswold, Griswold 6 & 7 vol 2, pages 947, 966.